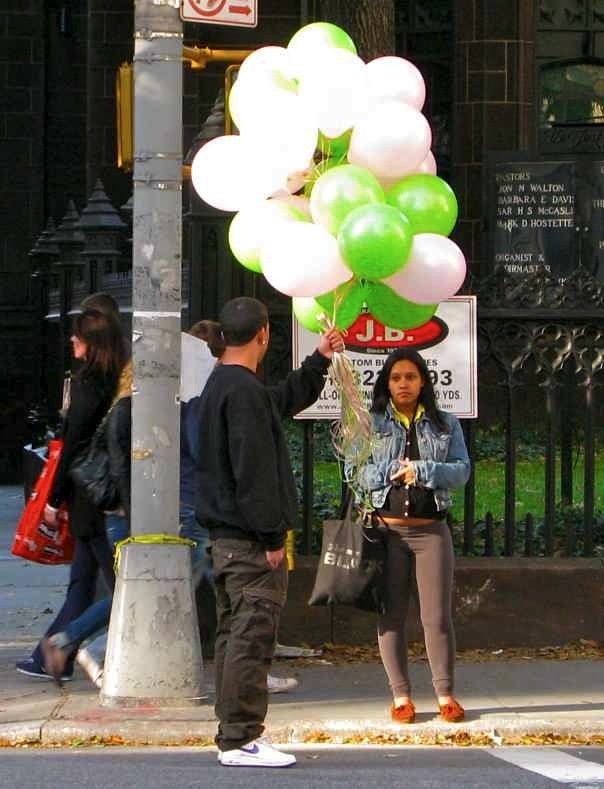 A man with balloons on Fifth Avenue. Ah, yes, I remember the good ole days here in Greensboro (I lived here from 1958 -1968 before we moved back to Ohio). Let’s see – Go to Sears and there were separate (and not very equal) restrooms for whites and blacks, plus separate water fountains. Go to the Carolina Theatre (the largest movie theatre at the time) with a long and separate line for blacks who could only sit way up in the balcony. Get on the city bus to go downtown and there was a white line painted in the aisle that blacks couldn’t cross. They had to enter and exit the bus at the back and if there were more whites than seats up front, then blacks had to give up their seats and stand for the duration. Segregation here in the South certainly made an impression on this kid. It was ugly and it sucked for those who had no power. I could go on, but I think you get the point. Pat Buchanan better take an ice cooler with him when he dies . . .
And if anybody objected they would be the beneficiary of a nice little neck tie party. Buchanan represents Nativism, old waspish America. This past is dying a slow death and being replaced with diversity. How the cultural war plays out will be interesting. I would hope that the current trend of “corporate Democracy” has finally reached its peak and a more collective, sustainable and just system replaces it. Karen, exactly. For Pat Buchanan to get nostalgic about home much better it was is just insane and wrong.